Make the most of the delightful natural light reflecting from the Severn Estuary, open your room and add the designer touch with fantastic plantation shutters. No other window dressing can make such a feature of any window and door, while adding privacy, security and peace of mind. – Shutters are wipe clean; they do not hold dust, mites or mildews. 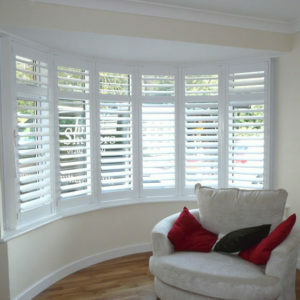 – Shutters reduce heat loss by up to 62% giving you added value and warmth! – Shutters are long lasting – and with us are lifetime guaranteed. – They give perfect light and shade control. – They add privacy and added feeling of security. – Shutters reduce outside noise and make any room a sanctuary. Just Shutters have the UK’s widest range of shutter styles, materials and finishes; so whether you are considering shutters because they look wonderful, or because they are a fabulously practical solution, you can be sure we can create the perfect shutters for your home. Since 2006, Just Shutters have been dedicated to creating the very best plantation shutters, while combining this with impeccable service. We have over the years served over 7000 customers and have earned an unsurpassed reputation – we have the highest percentage of 10/10 reviews over any of our peers. We would be delighted to show you just why we have earned this reputation, so if you are considering shutters for your home or business please call us on 0117 370 1594 or follow the links above. While we could sing our own praises, we feel it is our work rather than our words that should do the talking, please see below testimonials taken directly from checkatrade, the independent website that rates tradespeople. Fitted plantation shutters to three windows. Bedrooms and hall in our town house.